Learn how to tell stories from an animal’s unique perspective without resorting to writing humans in fursuits. In 1888, H.G. Wells wrote his first time travel story, “The Chronic Argonauts.” 130 years later, the concept is as popular as ever , with people still trying new takes on it. Why is time travel so perennial a theme? What are some of the different rules we’ve seen, and how do they make for good storytelling? In your original fantasy setting, everything the characters own has to come from somewhere. Let’s talk about how to build a believable material culture for your world. How to look for signs that you might not be dealing with a legitimate company – including common tactics such as pay-to-play, signing over derivative works, and others. Authors Sarah Avery, Rosemary Claire Smith, and Carl Paolino read from their work. What do you do when you have two readers giving you different or even contradictory feedback? How much are you willing to let the feedback change your work? Some storytellers require a detailed outline to start fleshing out their story, but others prefer to write by the seat of the pants. What are some techniques to help you get better at one when you prefer the other? Authors and gamemasters welcome! Starting TODAY, you can buy my dinosaur role playing game. It’s 170,000 words of Cretaceous adventure. You’re invited to switch on the flux navigator and take my time machine for a spin. Oh, and watch out for those triceratops horns! You do want to get home in one piece, don’t you? It’s perfect for anyone who loves interactive fiction and/or dinosaurs. Check out T-Rex Time Machine from Choice of Games. What stands almost as tall as a giraffe, has hollow bones as thin as a playing card, and a 33-foot wing span? 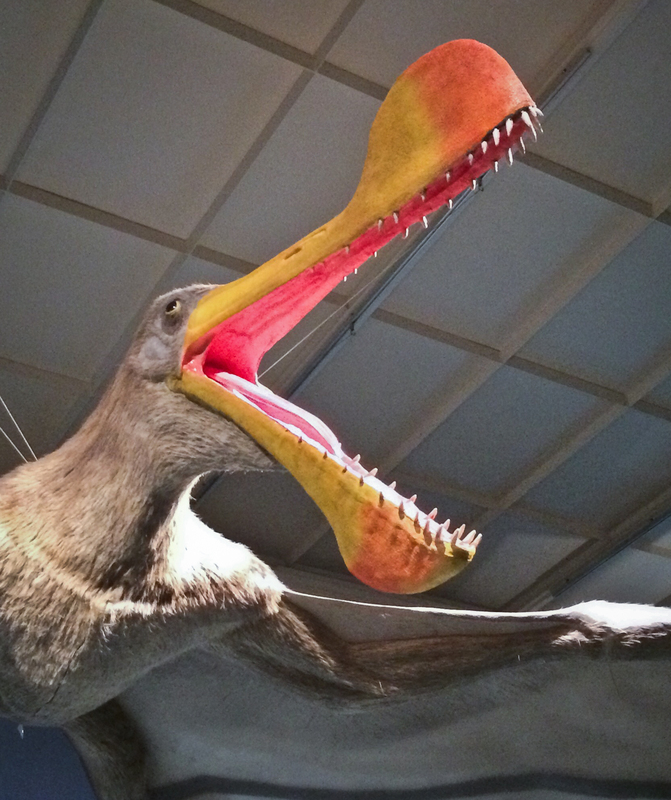 No, it isn’t some imaginary creature, but rather an extinct pterosaur that lived during the Cretaceous. 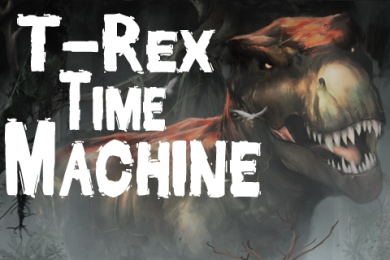 I feature its relatives in T-Rex Time Machine, my interactive fiction RPG. Soon, you’ll soon get to spend time with this fabulous critter plus a slew of dinosaurs, courtesy of me, Choice of Games, and the raging power of your imagination. In the meantime, you could read some of my other dinosaur stories or check out some other remarkable games from Choice of Games. To say that I am excited about unleashing it upon the world is a vast understatement. One neat thing about the games produced by Choice of Games is that you can play them again and again by selecting different attributes for your character, even different names and genders. Look! Look what a terrific cover for my interactive fiction RPG to be released soon. I don’t think the talented folks at Choice of Games could have gotten me a better cover for my game! I do hope you’ll all take my time machine out for a spin when it’s gassed up and ready to go. Oh, and when you get to the Cretaceous, keep your eyes out for that T rex. T-Rex Time Machine went into beta test this morning. That’s the name of my interactive fiction game in which you will soon get to spend time with the dinosaurs, courtesy of me, Choice of Games, and the raging power of your imagination. The current plan is for the game to be available this upcoming holiday season. In the meantime, you could read some of my other dinosaur stories or check out some other remarkable games from Choice of Games. To say that I am excited about unleashing it upon the world is a vast understatement. 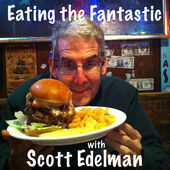 I was interviewed on today’s episode of the Scott Edelman’s podcast, Eating the Fantastic! That in itself is pretty fantastic. 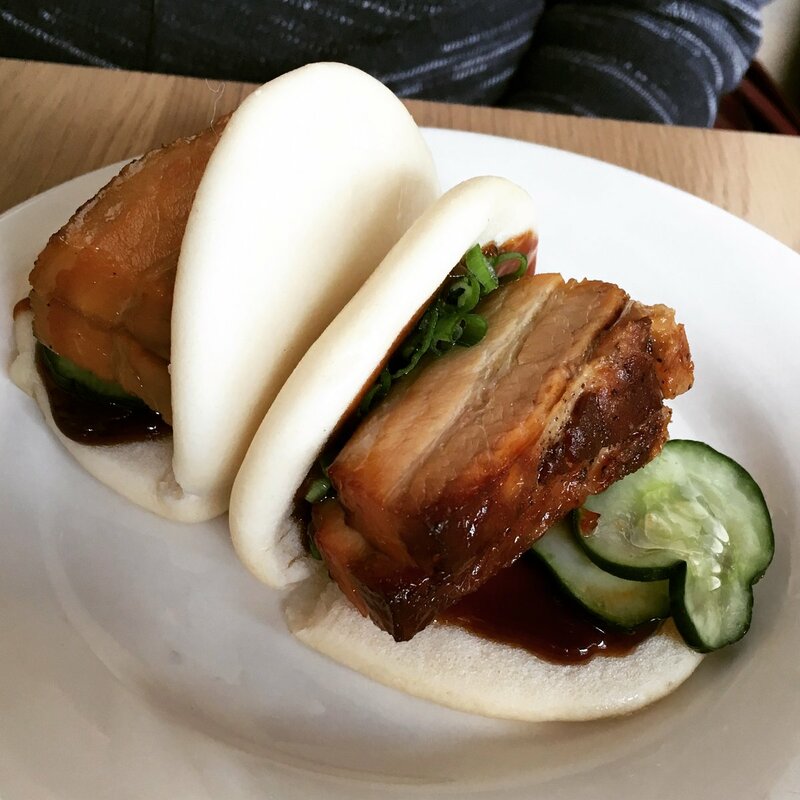 In case you don’t know, Scott’s a writer, editor, foodie, and the driving force behind the podcast, Eating the Fantastic. Over scrumptious meals (and you ALWAYS want to go to restaurants he picks out), Scott interviews science fiction, fantasy, and horror writers, as well as editors and other creative types about how they got their start, what they’re working on now, and whatever else comes up. I’ve been enjoying his interviews for well over a year. But anyway, I hope you’ll listen to the podcast as it was my chance to talk about attending Clarion and Taos Toolbox, writing for Analog, doing readings, and other topics before unveiling my major new writing project involving dinosaurs. I hope you’ll listen. I’ll blog more about my latest project in a few days. Until then, Scott has the exclusive. 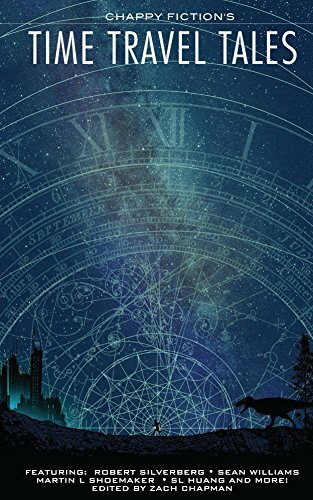 Calling all lovers of stories about slipping into the past, seeing living dinosaurs, getting a do-over for a crucial event, saving the future, and wrestling with the paradoxes of time travel: Check out this wonderful anthology of 20 time travel tales. Editor Zach Chapman has done a terrific job of assembling an entertaining collection of remarkable stories by Robert Silverberg among others. It includes my very first story of the time travel adventures of Marty Zuber, “Not with a Bang,” which was first published in Analog. You’ll learn the real reason the dinosaurs went extinct.